Romania Motorcycle Tours offers you the highest level of quality and services. We have chosen for you the best accommodation and food so that you can enjoy each minute spent in Romania. The hotels are mostly located in the mountains and valleys with a spectacular view, some of them offers spa and swimming pool as well as secured parking and other services. The people are very friendly, and the staff is always very supportive. Most of Romanians speak English. Internet coverage is also available without any extra cost. 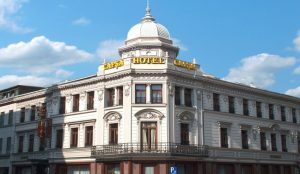 For example, in Bucharest, you will be staying in one of our 5* hotels selection in the middle of the old city center. The hotel has an excellent location, attractions and places that we present to you with our professional services in our guided and self guided tours are just a walk from your hotel. Breakfast is included and will be served each morning at the hotel. Dinner can be either enjoyed at the hotel restaurant or in other restaurants with excellent cuisine recommended and used by us. All tour participants will be provided with the hotel names, address and contact numbers about one month prior to the beginning of the tour. If you have any questions or special requests regarding accommodation, please call or email us. We’ll be happy to offer you more information.